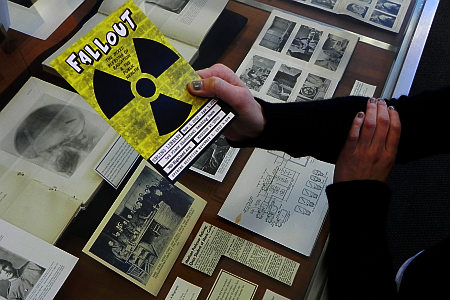 If you've gotten to see "Fallout" at Ebling Library--or even if you haven't!--here's your chance to find out how the exhibit was put together! Join Ebling Library for Wednesday Nite @ the Lab on Wednesday, February 20th from 7:00-8:15 in Room 1111, 425 Henry Mall. “Fallout” is an examination of subjects such as the early use of x-rays in diagnosis & treatment, occupational hazards of working with radiation, the military use of x-rays, the history of tanning, a UW connection with Marie Curie, bomb shelters in the 1960’s, the bombing of Hiroshima & concerns with nuclear accidents like Three-Mile Island, UW’s Departments of Medical Physics & Radiology, shoe fitting fluoroscopes and the like.